You won’t be in Turkey long before you notice you are being watched. Large, mostly blue eyes hang from buildings, cars, above doorways, and feature in jewellery. These eyes are called ‘nazar boncuk’ in Turkish and are often referred to, rather misleadingly, as evil eyes. 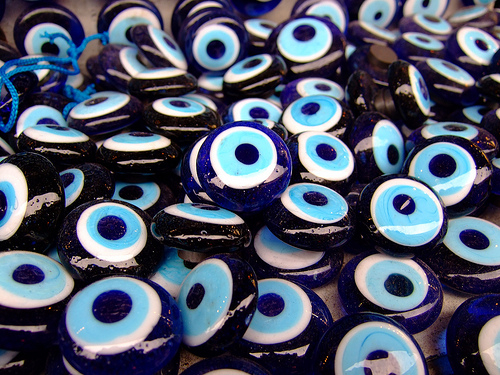 The evil eye is in fact a benevolent eye that wards off evil. Across the world it is widely believed that a look of the wrong kind from someone can bring bad luck, hence the phrase ‘to give someone the evil eye’. 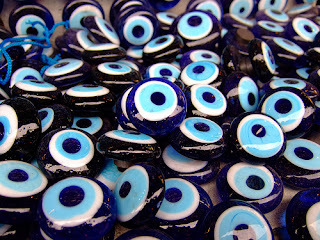 In Muslim society it is also strongly believed that evil looks bring injury or bad luck because, although it is believed that only God can truly offer protection from evil, the phrase ‘the influence of an evil eye is a fact,” features in Islamic literature (Sahih Muslim, Book 26, number 5427). 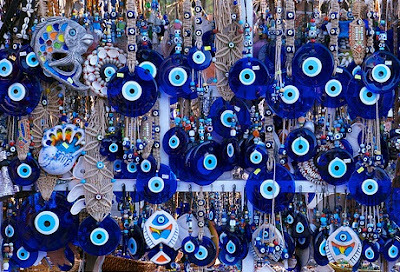 It is believed that misfortune from an evil gaze can be deflected with another eye, hence the Turkish habit of surrounding themselves with evil eyes. Envy is predominantly what is guarded against, and therefore it is not uncommon to see articles of value, either financial or emotional, adorned with evil eyes. They are frequently built into the walls of houses, found hanging from the rear-view mirrors of cars, or on necklaces. Newborn babies often have tiny evil eyes safety-pinned to the back of their shoulders. Evil eyes come in many shapes and forms. The eyes that you can hang up were traditionally made from clay but nowadays are often made of glass or ceramics. They are often very plain but can feature intricate detail in their design. In jewellery they are frequently made from glass or plastic. 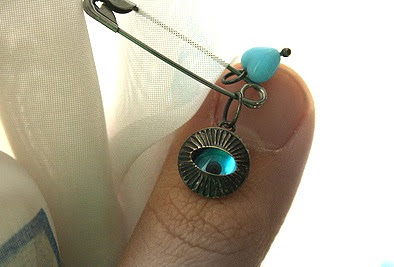 They often feature in pendants but also on rings, earrings and even hairclips. The evil eye is commonly found in Mediterranean Europe and the Middle East, but is found in many countries including those as far away as Mexico and some in South Asia. Across the world different cultures have different beliefs and superstitions. What are yours?